The Music City will be rocking this weekend with four genres of music performing against each other on the same stage. The stage, the 2014 NCAA Women’s Final Four. Connecticut, Notre Dame, Stanford and Maryland have descended on Nashville, Tennessee. Both Final Four games are repeats of matchups from the regular season. The squads individually have leading artists on groups or teams who fit a music genre type. Let’s begin with the headliner. Hip hop music is arguably the most popular genre of music; UConn’s women’s basketball team is the most popular of women’s basketball even among the professional level. The Huskies are led by Geno Auriemma, their Jay-Z. Jay-Z has been in the hip hop industry for 26 plus years, Auriemma is in his 29th year. Their longevity in the music and sports industry respectively is admired in both cultures. UConn enters the Final Four with an unblemished record for the sixth time in school history. The Huskies have posted four undefeated national championship seasons (1994-95, 2001-02, ’08-09 and ’09-10). Each of the four head coaches in this year’s Final Four has won at least one NCAA championship. In fact, they have 12 titles between them. UConn’s Geno Auriemma leads with an NCAA record eight trophies (1995, 2000, ‘02, ‘03, ‘04, ‘09, ‘10, ‘13), followed by Stanford’s Tara VanDerveer with two (‘90, ’92). Notre Dame’s Muffet McGraw (’01) and Maryland’s Brenda Frese (’06) each have one. Auriemma and the Huskies will battle on the stage versus VanDerveer and her Stanford Cardinal squad, a Jazz group in my eye. Jazz is considered to have its roots in the blues. The blues is what the Stanford Cardinal have been singing with all the attention drawn toward the Fighting Irish in the Midwest and Huskies out East. 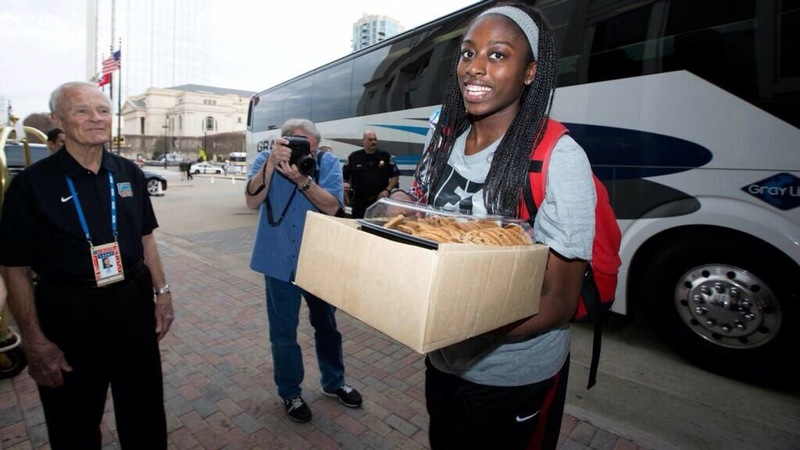 Leading the Cardinal is senior Chiney Ogwumike. She is the Lena Horne of her genre. Horne brought swagger to jazz. Ogwumike is the only player in the country to rank in the top 10 nationally in scoring (26.4 PPG), rebounding (12.1 RPG), field-goal percentage (60.4) and double-doubles (26) entering the Final Four. Sunday’s match up between Stanford and Connecticut will mark the fifth time that the schools will clash at the Final Four. Only UConn and Tennessee have met more times (6). Warming up the stage in the opening act will be the Maryland Terrapins and Notre Dame. The Terrapins are my R&B group. I remember listening to the best R&B female group of all-time growing up, TLC. Maryland’s Brenda Frese is making many remember and know the Terrapin name. Frese can be the Coach in T-L-C; L can stand for Lexie, Lexie Brown and T for Thomas, Alyssa Thomas. Lexie Brown is the Terrapins’ second-leading scorer (10.1 PPG) behind senior All-American forward Thomas. Brown has basketball in her genes. She is the daughter of former NBA player and Slam Dunk Contest winner Dee Brown and her mother Tammy played college basketball. Maryland senior Thomas has posted a school-record 66 double-doubles in her career and is one of only four players in NCAA history with six triple-doubles, her most recent against Florida State on Feb. 20. Thomas, the three-time ACC Player of the Year, played lights out versus the Seminoles finishing with 22 points, 12 rebounds and 12 assists. Maryland is one of the most dominant rebounding teams in the country, out-grabbing its opponents 1,468 to 1,076 on the season. The Terrapins rank third nationally with a +11.5 rebounding margin this year. Country music is eclectic in its own style mixing folk, blues and even gospel to name a few. It originated in the Southern regions of the country; however just like the Notre Dame Fighting Irish, it has a strong following. Notre Dame comes in at 36-0. Its current school-record winning streak is the longest by any Fighting Irish team (regardless of sport) since World War II, passing the performance of the 2001 Notre Dame softball team (33). It also puts this year’s women’s basketball team in the same conversation with Frank Leahy’s legendary Notre Dame football teams from 1946-50 (39-game unbeaten streak 37-0-2 record that included three national championships). Chances of winning it all in the Music City diminished a bit. Senior forward Natalie Achonwa’s career with the Irish ended with a torn ACL in the elite eight win against Baylor. That is minus 14.9 points and 7.7 rebounds per game in Notre Dame’s rotation. The pundits have looked ahead at the start of the tournament predicting the final game featuring the battle of the unbeatens if both UConn and the Fighting Irish win on Sunday, with Connecticut cutting down the nets for its ninth title. I’m ready for an encore of the four teams again before the stage curtain drops.